Clary Fray: This whole parabatai thing seems oddly intimate, if you ask me. Isabelle Lightwood: You don't know the half of it. 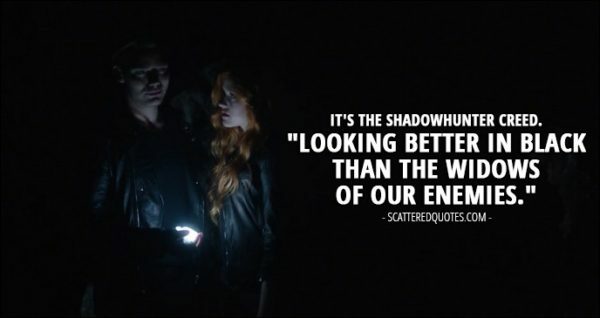 Hodge Starkweather: Now, Magnus is one of the most powerful warlocks I've ever known. He has a deep mistrust of Shadowhunters. 14.5.2017 He has a deep mistrust of Shadowhunters. Clary Fray: He looks like the Downworld's David Guetta. Isabelle Lightwood: Guetta's already a Downworlder. Vampire? Ever seen him in the daylight? 14.5.2017 Guetta’s already a Downworlder. Clary Fray (to Simon): I couldn't live without you, Simon. You're all I have left. My whole life just disappeared. I'm supposed to... be this other thing, live this other way. You're my best friend. 14.5.2017 You’re all I have left. Simon Lewis: You know I'd do anything for you. Clary Fray: You don't have to die! Simon Lewis: I'd rather not do that. 14.5.2017 I’d rather not do that. Simon Lewis: I would never throw things, honest to God! Oh, God. You guys can't say God, right? Raphael Santiago: For God's sake, what are you trying to say? 14.5.2017 You guys can’t say God, right? Jace Wayland (to Clary): The blade never dims. It's saying you belong together. You're part angel, Clary... like all Shadowhunters. It's not something you understand in your mind. It's something you know because it's pulsing through your body. It's in your blood. 14.5.2017 It’s in your blood. 13.5.2017 Looking better in black than the widows of our enemies. Simon Lewis: I've seen every horror movie ever made and the funny best friend who gets left behind... dead man. 13.5.2017 The funny best friend who gets left behind… dead man. Clary Fray: I'll do anything. Walk through fire, battle demons, whatever it takes. I have to get my mom back. I can't... I won't lose her. 13.5.2017 I have to get my mom back. Isabelle Lightwood: Don't tell me you're afraid. Simon Lewis: Are you kidding me? I was born afraid... which sounded a lot better in my head. 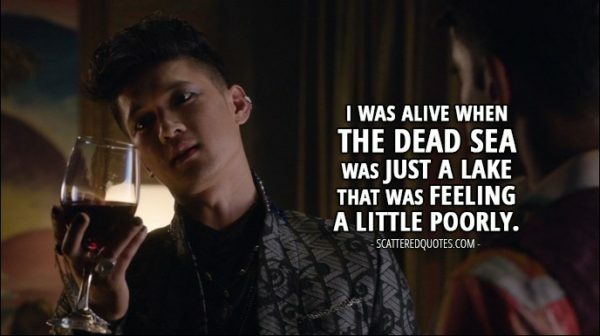 Magnus Bane (to Dot): Are you really going to risk your life for a Shadowhunter? 13.5.2017 Are you really going to risk your life for a Shadowhunter? Simon Lewis: I'm tough. I can handle runes. So, uh, bring on the runes. What exactly are runes? 13.5.2017 What exactly are runes? Jace Wayland (to Clary): All the legends are true. We're Shadowhunters. We protect the human world from the demon world. 12.5.2017 We protect the human world from the demon world.